Bristol, 21 November 2017 – Local Authorities from across the UK converged on Birmingham last week to learn about ways to improve transport services. School and special educational needs Transport Planners from Councils as far afield as Somerset, Buckinghamshire and Sheffield met at Birmingham University as part of an event hosted by transport planning software company QRoutes. 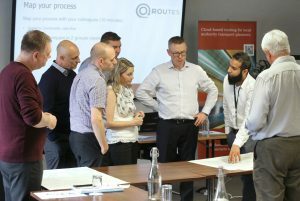 The event brought together users of the QRoutes software, which is increasingly being used by local authorities to automate the complex tasks of planning transport using in-house fleets and contracted taxi services. With budget cut backs and increasing demands for services, attendees shared knowledge and experience and learnt about new software features designed to improve route planning and optimisation. Part of the day involved an interactive session with each council charting out the structure of their transport operations and a group discussion on the big issues affecting the management of school and special educational needs transport. Most agreed that the greatest challenges involved juggling demands from parents, schools and local politicians against the limitations of time and resources.